With 2017 approaching, some people have already started thinking about their upcoming goals for the next year. These individuals are the ones that always seem to know exactly where they are going and always seem to be in control. They know what they want, and they are going for it! And, they even seem to like and enjoy what they are doing in their lives. In other cases, however, there are individuals who don’t like what they are doing in their lives or careers. They don’t know what to do next, and they don’t know what they want for their future. If you’re in that situation, and would like some answers — and to change your life — there are seven steps you can begin to take (today)! Feel free to check out the highlights in the following presentation, or keep scrolling to read the entire article! 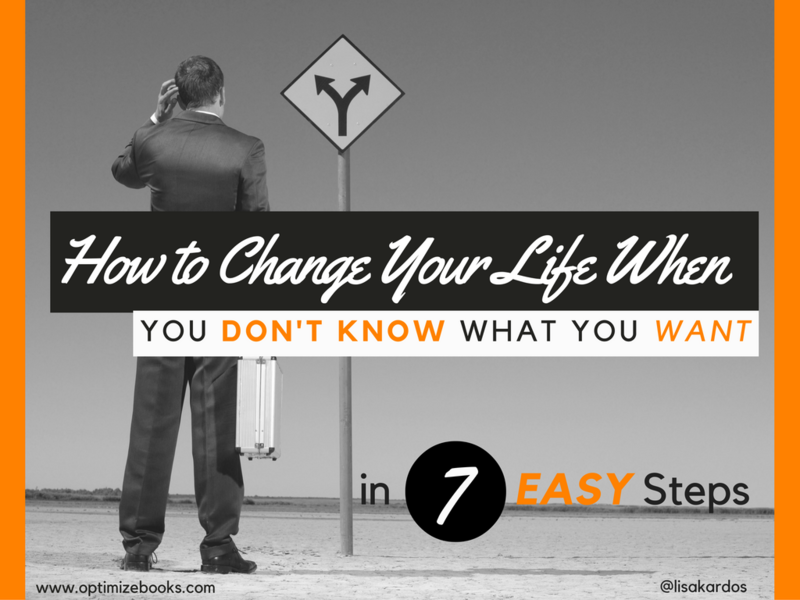 How to Change Your Life When You Don’t Know What You Want in 7 Easy Steps from Lisa Kardos, Ph.D. Step 1: Let go of the idea that you need an epiphany before you take the next step. I have worked with some clients who feel trapped and stuck by their decisions. They may have built up their education and expertise in an area that turned out to be unappealing, or they may feel like they have plateaued in their career. Therefore, the first step to changing your life, is to actually let go of the idea that you need an epiphany or major moment of clarity to make change in your life. Waiting around for inspiration will lead to simply more waiting around, and typically no answers! Step 2: Shift your mindset: you just need to know the very next step…not the exact destination! Building on Step 1, once you let go of the idea of needing an epiphany, it’s best to start shifting your mindset to the idea that you don’t need to know all the answers, or even what your eventual path or destination will be. The key to changing your life is taking action. While it’s important to think before you jump into something (more on the process of deciding the next steps shortly), the most important thing to consider is to take a next step in the first place! The idea is that taking action will actually give you more answers. For instance, once you take the very next step, and you begin the process of getting data and feedback about what you are trying or attempting, you’ll start getting the answers you have been seeking — such as “I like this” (or don’t like it). Beginning this process will enable you to collect feedback as you go along and eventually you will be able to “course correct” and make adjustments because your goals will become clearer as you collect the data you need to make your decisions. Step 3: Take inventory: Write down all the things you know how to do and all the things you are interested in! Now that you have let go of the idea of an epiphany, and understand the importance of taking action, it’s time to start the process of figuring out what those next steps will be! To do this, it’s often helpful to “take inventory” of your life. Often we are running on autopilot — we don’t even realize what we know (or don’t know). Therefore, I recommend taking a few minutes to list out your skills and interest areas. This will give you something concrete to work with in the next steps, and it will help you get organized! Step 4: Identify the next step for each skill and interest area from your inventory. Once you have your concrete list of skills and action areas, you can create an adjacent column, and list out the very next action step for each of those skills or areas. For instance, if you have writing skills, the next action step would be to further those skills or make a product from those skills, such as a book or a blog. You could list out the next action step to read a book on the subject of writing or publishing a book. Though you may have a “hunch” about an area you should explore, it’s best to attempt to be as objective as possible during this process so that you consider all options and possibilities. Therefore, be sure to list out your next action steps for every area you listed! Step 5: Choose one of the next steps you identified and start it. Now that you have everything laid out on paper, everything from your interests and skills to the identified next steps for each of those areas, you can visually see all the possibilities available to you. After reviewing all this visually, you can more easily choose an interest or skill that you would like to pursue further. Naturally it may be difficult to make this choice. Taking some time to examine your feelings about each of the areas, and also what may make sense logically for the ones you feel strongly about, will be helpful for your decision on which area to pursue. It’s also important to consider that it’s not “the end of the world” if you start to pursue one of these paths and later determine it’s not right for you (more on this in the forthcoming steps). To a certain extent, you need to rule things out so that you can narrow your focus. Sometimes you don’t know what you like until you try it. Again, this is better than sitting around and waiting for inspiration to hit you. You’ll have made the most of your time by beginning the process to get feedback and answers for your life. Once you have chosen which next step you’d like to take, you’re ready to take the action associated with that step! After taking that first step, it’s important to assess what the next few immediate steps would be for the path you began, and take the corresponding actions identified. This part of the process is a “data collection” period. Often you don’t know if you like something or if it’s right for you based on the very next step; you need to take at least a few action steps, and spend a few weeks or months on it. Of course this is case-by-case and dependent on the specific area you chose. The important thing is to be observant during this step: notice if you like this path so far and focus on your progress. The first few steps of any process, especially something new or outside of your comfort zone, will be difficult, so be careful not to immediately rule out a path. After you hit a milestone and have completed a number of steps, however, you can get a better assessment of where you are (and where you’d like to be). Step 7: Evaluate and make adjustments based on the feedback and data you collected. Collecting data, feedback and making observations from Step 6 will enable you to implement Step 7, essentially to “course correct” as needed. As mentioned in Step 2, having additional information will enable you to make informed decisions about your path forward. You can determine if you’re on the right path, or if you need to tweak your path slightly. You may be able to refine your focus and create a goal around that path. There are so many more possibilities that will open up to you once you have taken these steps, especially as opposed to waiting for an epiphany! In summary, these seven action steps are not hard in and of themselves — in fact they are quite easy to take, once you have accepted the idea of making change through very small, daily changes (which is more realistic than waiting for a bolt of lightning or overhauling your life)! 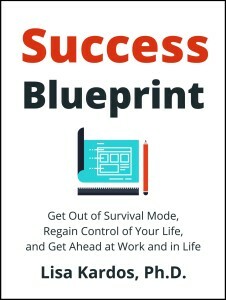 To learn more about this, and to access special checklists and additional information and resources on this topic, check out my new book, Success Blueprint: Get Out of Survival Mode, Regain Control of Your Life, and Get Ahead at Work and in Life. You can access the Amazon version by visiting: http://success.lisakardos.com!